Leaving town for an upcoming vacation or business trip? At the Ruff Motel, we’ll make sure your dog receives the best care possible with our overnight boarding services. Our Ruff team will make them feel like they are on their own vacation, giving them loads of love, exercise and attention, and including them in Ruff Daycare activities during their stay. The Ruff Innkeeper will be there all night monitoring their needs and assisting in anyway they can. Of course, this includes cuddling and bedtime stories. 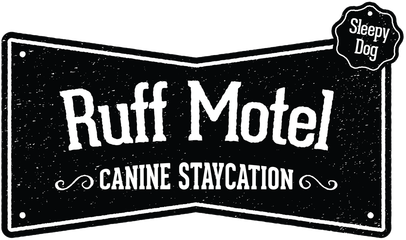 Ruff Motel has 3 private kennels, each with its own comfy raised bed. Our kennels have the ability to house multiple dogs in their household. The Ruff Motel also offers pack boarding which allows them to sleep together on their own bed in a warm comfy space with their buddies. To help them sleep better, we encourage you to bring along an unwashed shirt of yours or their special blanket for bedtime. While House of Ruff offers grain-free food at $4 per meal, we encourage members to bring their own food in a container with their dog's name and feeding instruction. We will be sure to follow any special feeding instructions and administer medications whenever necessary. Boarding is reserved for Ruff Daycare ​and Ruff Park members only. Daycare members have priority over park members. Please review Ruff Motel Rules & Policies before contacting us. To ensure your dog's comfort and reduce their anxiety, we require your dog attend daycare at least once prior to boarding them. will be subject to a fee of 25% of the value of the scheduled stay. 1-2-3 Membership Registration: 1. Review our services and review Ruff Motel Rules & Policies. ​2. Click on Join the Club to download and complete your Membership Registration form.